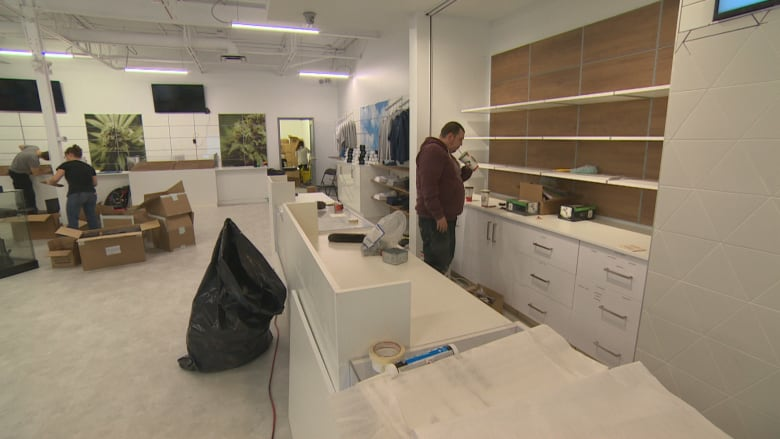 The retail space at 827 Dakota St. is one of five Winnipeg retail spaces that will open on Wednesday morning, the day recreational cannabis becomes legal in Canada. It’s a large, white room, with only a few glass display cases in the centre and spaced-out shelves on the walls. In the back right corner there’s Delta 9-branded clothes. In the front left corner, there’s a space for one-on-one product consultations. There’s a large Delta 9 logo made of living moss on the wall and images of clouds. 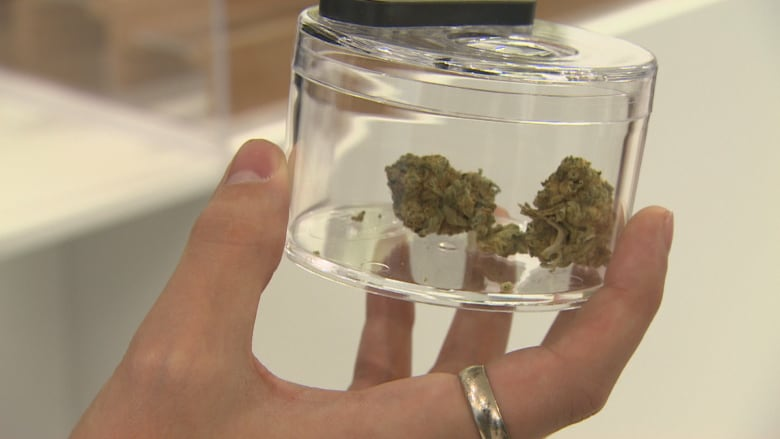 It’s at the back of the store where Arbuthnot says things “get a little bit more interesting.” A long glass display case forms what they’ve dubbed the “sensory bars.” Customers can get a closer look and smell — but not taste or touch — of the cannabis itself, removed from its official packaging and placed into glass jars only staff can handle. 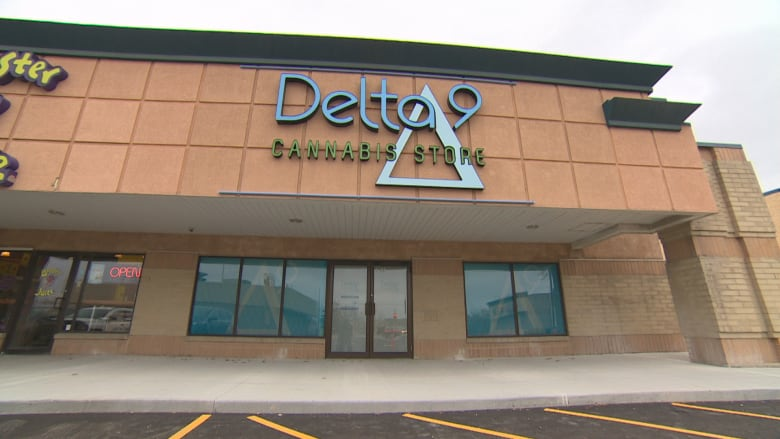 Delta 9’s cannabis store at 827 Dakota St. will open at 10 a.m. Wednesday morning. On Tuesday afternoon, the store was still a jobsite. Dozens of workers and staff were still drilling in millwork, stocking shelves and spraying, wiping and dusting glass display cases. The first load of cannabis — seven or eight varieties from two separate producers, including Delta 9 itself — had just been loaded into a vault the size of a small room in the back. But by opening at 10 a.m. Wednesday morning, Arbuthnot says the space will be a clean, bright and comfortable place to buy weed. “We had been joking a few weeks ago at our management meetings that we would open even if the paint was drying and it certainly will be the case,” he said. 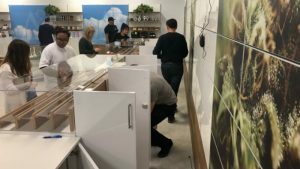 Staff at Delta 9’s St. Vital cannabis store prepare on Tuesday afternoon for opening day Wednesday. When you walk in, you’ll be able to browse the accessory options, or ask for help from what Arbuthnot called “roaming product specialists” who can grab things out of locked cases for a closer look. When you want to pick their pot, head to the back wall to see the options. 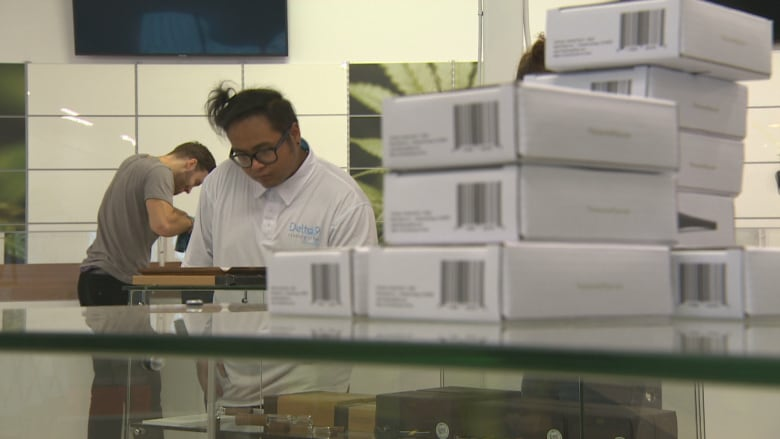 The prices per gram range from $7 to $15, although Arbuthnot said he expects the prices could drop in the future if supply increases. As he’s talking through the sensory bar experience, a staff member hands him one of the small jars — the first one to be filled with cannabis in the store. “Oh, wow,” he said. Delta 9 CEO John Arbuthnot holds a jar with cannabis inside the company’s store in Winnipeg’s St. Vital area. Jars like this will be lined up behind a glass display case at the back of the store for customers to see and smell. Once you’ve decided what kind of cannabis you want, you walk over to one of the six checkouts along the right wall. The touchscreen tills weren’t set up yet on Tuesday afternoon, but they’re sleek and white like the rest of the decor. The staff who operate them will have know-how on the products and safety and they’ll ask for your ID again. The checkout area of the Delta 9 store was still being assembled Tuesday afternoon, but will house 6 tills by Wednesday. The store is set up for crowd control, he added. At any given moment, 16 to 20 staff will be on the floor, making room for roughly 50 customers. Cannabis that’s in the main retail room is stored in locked cases or hidden behind collapsible shutters at the checkout. Delta 9 staff talk inside the St. Vital cannabis store’s vault, where the majority of its cannabis is kept. On Tuesday afternoon, talking loudly above the sound of drills, Arbuthnot said he had his own “‘wow’ experience” when he walked through the doors himself.